Looking for advice on natural health and wellbeing? Your local independent health store can offer a wealth of knowledge and expertise. This month we speak to Carol Faulkner, owner at Northampton Health Store. The most important first line of immune defence would be a prebiotic and probiotic. Both are flavourless and come in powder form so are very child-friendly. Providing your child’s body with more good bacteria helps to protect them against the bad germs and bacteria that can circulate. They will also help children to fight off infections should they be prone to them. Spring bugs and allergies are already starting to make an appearance as my grandson’s hay fever symptoms have begun to kick in. He was a little bunged up this morning and was coughing and I do find that’s the onset of his hay fever symptoms. Children affected by hay fever may also experience cold symptoms. Elderberry syrup can be a good option to help fight off any impending virus or infection. It is also really good for breaking down mucus and the taste appeals to children too. I’m personally a big fan of echinacea. The old echinacea for children supplements worked really well, especially those that contained plantago which is great for ears, nose and throat. Children’s zinc is great for immunity and also for skin-healing. It can be a particularly good supplement for children that are prone to eczema and asthma. I would also encourage mums to introduce more good fats into their little ones’ diets, especially when they are affected by hay fever and asthma. Increasing your child’s vitamin C intake can also be beneficial such as introducing fresh orange juice at breakfast time or encouraging them to snack on fresh fruit a little more. I tend to stress to mums to focus on their children’s diet. What your children eat is key as we only want to be adding supplements when we feel our little ones cannot get enough through their diet. Many mums tell us their children are refusing to eat fruit and vegetables and I often ask whether they eat together as a family. If you aren’t eating with your little ones, it can be difficult to encourage them around what they should be doing if you aren’t demonstrating that yourself. It can be difficult to introduce more fruit and vegetables to your children’s diet. If they can adapt to drinking smoothies, that is a great way to increase their intake. If you find you are having to hide fruit and vegetables, try giving them a choice. This would be two healthy options that you want your child to have, leaving them to decide which they would prefer. They will be more likely to accept and try their choice as it’s something they have selected. If you do feel supplementing is the best option, go for a high quality multivitamin and add it to healthy main meals. The store has been running for over 25 years and was previously known as Health Quest. 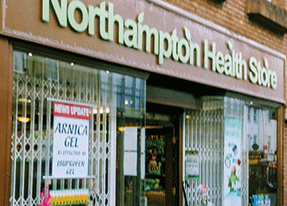 For the past two and a half years, it has been based at The Drapery as Northampton Health Store. The store is very popular and has a loyal customer base. The team are passionate and knowledgeable about natural health and take great pride in ensuring customers walk out with exactly what they need whether that is advice or a particular supplement or product. Carol also has a background in sports nutrition.